When you are looking for a used car, browsing through the Autotraders Cape Town Auto Freeway magazine can give you some good options and lead you to your dream wheels. Auto Freeway magazine and other publications are produced by Auto Trader, showcasing a range of used vehicles selling in your area. There are three different Auto Freeway magazines distributed in three regions – Cape Town, Kwa Zulu Natal and Gauteng. The magazines are published on a weekly basis and all are provided free of charge. 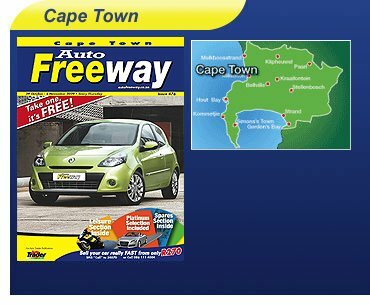 The Autotraders Cape Town Auto Freeway magazine is available from a number of outlets in the region, such as most places where newspapers are found. When you are looking for a used car, simply get hold of the magazine and begin your hunt. Budget, baby: If you have an idea of what kind of vehicle you would like, you need to first establish how much you can afford to spend on your used car. It is also worth contacting a number of vehicle finance providers to see who can provide you with the best finance option and to see if you qualify for vehicle finance. Set a strict budget and don’t be tempted into buying a car that is more expensive than you can afford. Do your research: The only way you will know if you are looking at a good deal in the Autotraders Cape Town Auto Freeway magazines to compare similar cars and their prices. Factors to consider include the make and model, as well as the car’s mileage, service history, fuel economy, its depreciation value and other such criteria. If you know what the car you are looking at is worth you will be able to make educated negotiations and get an accurate price for your car. Limit the list: Don’t make too long a shopping list of cars and don’t make too many circles in your Auto Freeway magazine. Having too many choices will mean too many cars to follow up on, costing you both time and money. Rather choose a few of the best and chase them up before moving on to the rest. Expect to inspect: If you don’t know much about cars yourself, get hold of someone who does. Before you buy a car it is imperative to check it out to discover any faults or flaws. If you discover any faults you can then use them as leverage to lower the price of the car. It is also important to test drive the vehicle to ensure that you feel comfortable behind the wheel. In older vehicles, excessive exhaust fumes are bad news, and keep an ear out for unwanted rattles and shakes and you drive. Double-check the docs: Especially if you are buying form a private individual you need to check that the registration documents for the correct name of the seller and their correct address. Check the car’s service history carefully and compare the vehicle’s actual mileage with the roadworthy certificates and receipts. Niggle and negotiate: Negotiating a deal can save you a lot of money. You need to come into a negotiation with knowledge about what you should be paying for the vehicle as well as a cool head. Don’t feel pressured into buying the vehicle; just because you are looking it doesn’t mean you are buying. Find your finance: Find the best option to finance your vehicle as there are a range of options out there. Always a receipt that states that the vehicle does not have any outstanding money owed. Remember to also sign the Change Of Ownership document, of which you keep half and the other half goes to the seller. To contact the team at the Auto Freeway Magazine in Cape Town, you can call them on 021 9149190 or email on atcpt@autotrader.co.za. You can find the Auto Traders and Auto Freeway website on http://www.autotrader.co.za and the office address is Unit 5 West Wing Terraces, Old Oak Office Park, Old Oak Road, Bellville, South Africa.